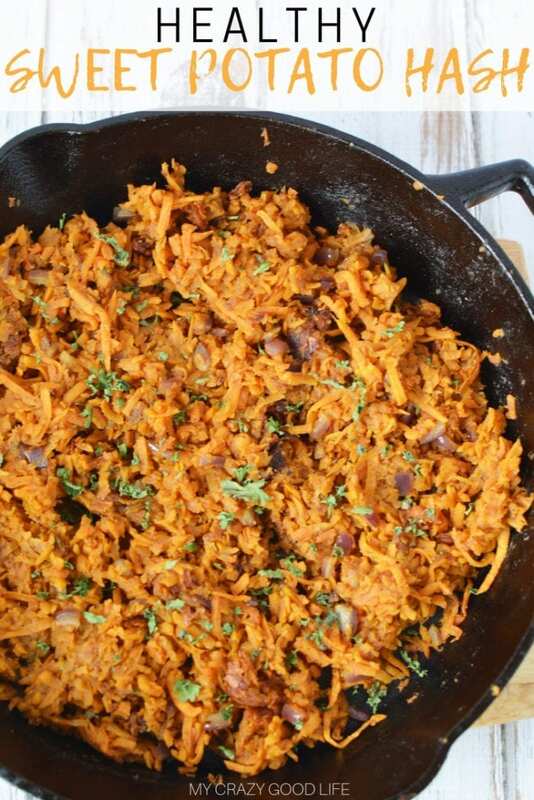 This shredded sweet potato hash is so filling and easy to make! Sweet Potato Breakfast Hash with red onions is a healthy anti-inflammatory food to start your morning with. The cinnamon and nutmeg add the perfect touch of sweetness. This recipe is also great for an anti-inflammatory diet, AIP, and paleo! This is a great way to work some extra veggies into your diet. I know it can be tough to get kids to eat enough vegetables, this recipe hides them well. It’s so delicious they won’t even complain that it’s made entirely from veggies! Do these shredded sweet potato hash browns take a long time to prepare? 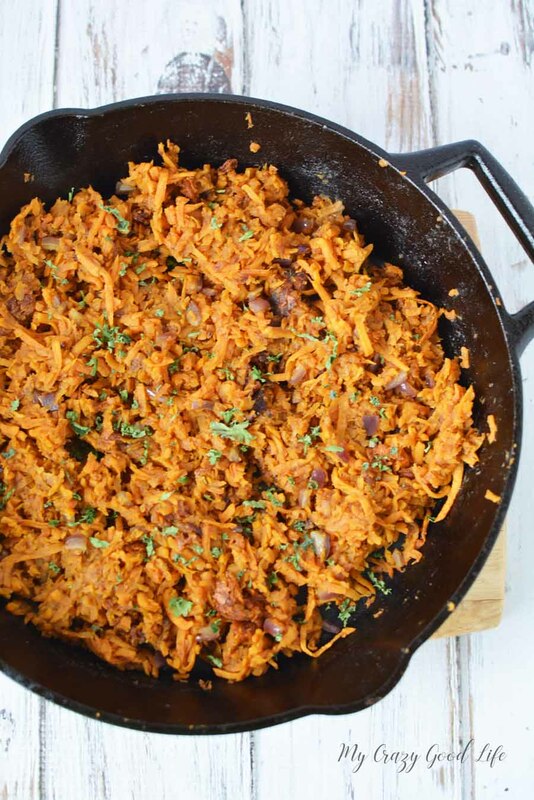 Making this sweet potato hash recipe is quick and easy thanks to the food processor. No need to break out the shredder, just toss them into the food processor and they’re ready to go in a few seconds. Is healthy sweet potato hash a breakfast recipe? Sweet potato hash is great for breakfast but it also makes an excellent side dish for brunch or even dinner! You’ll love it even more once you see how easy it is to make. How do I make this healthy sweet potato hash? Clean, peel, and shred sweet potatoes. Chop onion. The food processor works great for this part! Mix potatoes, onion, and seasoning in a large bowl or plastic bag and mix well. Add sweet potato mix and cook over med to med-low heat. Flip occasionally to lightly brown on all sides. Depending on heat, potatoes will take approximately 20 to 25 minutes to cook! 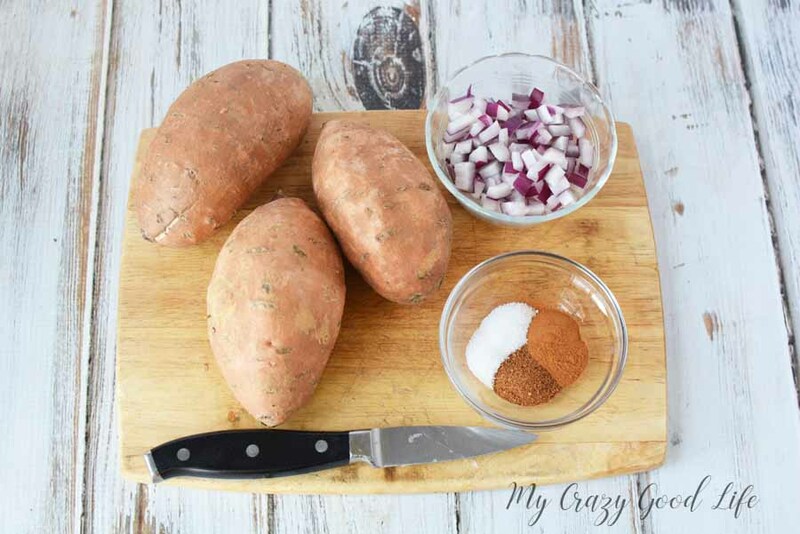 Do you have 21 Day Fix info for this sweet potato hash? This recipe makes about 6 servings. The container counts for the entire recipe as well as per serving are listed below! If you change any ingredients or amounts make sure to adjust the calculations. You don’t have to make any changes to this sweet potato hash recipe in order to enjoy it on the Paleo diet! It’s pretty simple recipe and with so few ingredients it’s easy to put together and a healthy choice for the whole family. 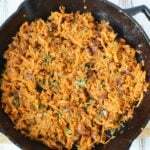 Can I eat this shredded sweet potato hash on AIP? Yes! If you are on the AIP diet (a much stricter version of Paleo) you can eat this shredded sweet potato hash recipe. With just five ingredients you’ll see that it’s not only healthy, and delicious, but also super simple to make. For those of you not familiar with AIP it’s a version of the Paleo diet that is used to help treat autoimmune diseases. There’s a strict list of foods that you can eat on the AIP diet so having a recipe like this, with just a few whole food ingredients, is fantastic! Are sweet potatoes good for inflammation? Sweet potatoes (like the ones used in this delicious shredded sweet potato hash) are amazing for inflammation and inflammatory diseases. Sweet potatoes are packed with vitamins C and E and on top of that they have carotenoids alpha and beta carotene which are all excellent at reducing inflammation. Everything from muscle spasms to asthma can be impacted by inflammation in your body, an anti-inflammation diet can help with a variety of ailments. These healthy sweet potato hash browns will help you start the day off on the right foot with a quick and delicious meal. This sweet potato hash is so tasty and easy to make. If you are looking for a delicious recipe that the whole family will love, this is the one! 3 Cups sweet potatoes peeled and shredded - a food processor works great for this! Depending on heat, potatoes will take approx. 20 to 25 minutes to cook"
Thanks for sharing, but Wouldn’t you have to count the 3 tablespoons of oil as that would be 1 1/2 tsp per serving, or am I missing something?